2014 edition of SAMOSA, has placed more emphasizes on the intended potential publics as the menu entails a wide variety of events that give room for everyone to be involved in the activities in one way or the other at different levels. When one hears of SAMOSA Festival for the first time, what comes to mind is a cooking competition centered around the popular East African-Swahili-Indian delicious snack, as the name suggests, but absolutely this is not the case. SAMOSA is a festival created with the major aim of attracting all kinds of people across Kenya to come together by offering a stage to celebrate, share and enjoy their diverse cultures, norms and heritage, through arts, music, poetry and drama so as to educate and create awareness in terms of peace togetherness, encouraging the Harambee spirit in our communities. It is a cross cultural festival, one of its kind in the whole region and held one’s every two years. 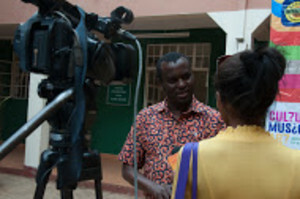 "The festival offers a unique platform to bring the community together and the theme this year is 'Mitazamo Yetu: Kenyan Perspectives,'" says Zahid Rajan, a printer by profession and who founded the fest together with Zarina Patel,Author and historian. SAMOSA recently organized an event dubbed, ‘Community Media Festival: Going To The Community’ as part of its planed August 13 to August 31 series of events this year in partnership with Kenya Community Media Network (KCOMNET), an umbrella of community radios in Kenya, that was held on Saturday August 23 at Dagoretti Empowerment Centre in the shanty Town of Kawangware, Digorreti South constituency in Nairobi- Kenya, with the aim of bringing community and mainstream media entities to meet culture and cohesion. Afterwards the festival will go into a one week extra screening of local films into September. Rajan’s vision for the festive is to work with different people with different ideas and professions from all cultures, encouraging them to sit in one room and interact, get to know share and understand each other better. "We work with numerous communities, universities, colleges and other informal entities on different projects, where we screen films and convene forums to discuss on issues of national cohesion and unity," he says. The festival also partnered with a number of community radio stations like Mtaani FM (Dagoretti), Koch FM (Korogocho), Pamoja FM (Kibera) and others. The aim of the Media Festival forum was to enhance the cohesion and integration efforts of Kenyans as they endeavor to overcome racial and ethnic biases. “The idea was simply to look at the role of community radios in promoting peace, love and unity among the societies,” says Nyang’ori Ohenjo, KCOMNET Policy Advisor. 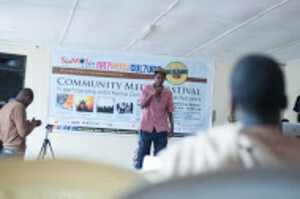 The fest also addresses issues affecting common mwananchi (citizen) at the community level via medium which are interactive, attractive, interesting and entertaining at the same conveying the intended message via picture exhibitions of the South Asian participation in the anti-colonial struggle, films on contemporary themes, performances and discussion forums. The events menu consisted of photograph exhibitions of the South Asian participation in the anti-colonial struggle and our founding fathers graced the wall, paintings and drawings, films on contemporary themes, Spoken word/poetry, music performances and discussion forums involving the youth and media personalities from different media houses. The festival is seen as a launch pad for new artists from the informal settlements as it has been a norm to give the youth a push to achieve their dreams. For Example, Sarabi Band, an Afro-fusion styled group had the opportunity to launch their music career on this platform at SAMOSA annual festivals few years back, where they screened their documentary about the band’s journey to stardom and into rise into a force to reckon with. Screening of short films by local film makers and individuals telling inspiring stories of the local communities across Kenya and achievements made amongst them, takes place to showcase rich talent, creativity and diversity amongst the youth, exposing the nuances within each culture in a non-offensive and vibrant, but critical form. 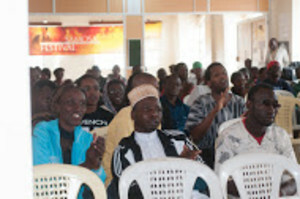 Previously SAMOSA Festivals has organized successful events such as the Hadithi Fest which featured performances such as spoken word, storytelling, prose and poetry which was entirely anchored on Kenya’s socio-political and economic realities under ‘Stand Up Shout Out and Zamaleo Act’ banner reflecting the festival’s theme, ‘Mitazamo yetu: Kenyan Perspectives’, through their performances. SAMOSA Festival has partnered with other organization such as PAWA 254 to organize hyped event before, such as the screening event of different movie genres from Africa and Asia entailing mostly of films that explore the status of our history, culture and society, with the aim of giving common people an opportunity to think about aspects of their political and social systems broadly. Among other planned events by organizers for this year include SAMOSA Film Festival in partnership with Film Kenya, several universities and slum dwellers; Hands off Our Elephants event with Wildlife Direct and Stand Up Shout Out; Cosmopolitanism in Kenya At 50 and Project, ‘Who Am I, Who We Are’ with Department of Literature, University of NairobiLiterary Colloquium and the Kenya museum.In the quest to establish unity and togetherness among different races and culture, the festival has worked with bands such as Daraja, which is composed of Kenyan South Asians, Africans and Caucasians, and which creates music from traditional and contemporary musical instruments. In arts, it has worked with contemporary dancers such as Boneless and Band whose performance dives back into history and contemporary themes from the South Asian and African cultures. The festive has been able to stage plays written by locals, such as ‘Beach Access’ which dramatizes the struggles of ‘beach boys’ along Kenyan coastal towns to regain access to their beach after the path to it is blocked by illegal developers. SAMOSA itself, - is an acronym for “South Asian Mosaic Of Society and the Arts”, and established in 2005 as a biennial cultural platform which blends culture, music, poetry, art and drama to convey messages related to the cohesion and integration of Kenyan society in a creative and expansive manner and the festival was used initially as a mechanism to channel the Kenyan South Asian population’s contribution to civil society in regard to cohesion and integration initiatives. With the adage saying by Margaret Mead ‘If we are to achieve a richer culture in contrasting values, we must recognize the whole gamut of human potentialities and so, weave a less arbitrarily human fabric, one in which each diverse gift will find a fitting place,’ The festival managed to bringing together more than 10 different ethic groups together and more than 100 people attended the community media fest. The event never disappointed, with pomp and color it rejuvenated the spirit of togetherness in Kenyans, driving the message was home of co- existence and living in harmony. Samosa - as a symbol of represents fusion of Asian and African cultures thus enhancing race and ethnic relations so as to foster nationhood, and by mixing and mashing entertainment and information as well as a stage to meet with Kenyans of all walks of life, something which the festival has come to be associated with it over the years.